Currently, I need a new blogging link-up to inspire me to write and actually finish a blog post. Fortunately, Lisa over at The Golden Spoons had provided me with just the thing! She has a new link-up for “Currently…” posts, updating readers on what we’ve been up to. I’ve been up to a lot. The first couple months of the new year started hectically and just kept going strong. This post is going to make me seem way too energetic, but as busy as I sound, I actually have plenty of time to mess around and avoid cleaning off my dining room table by watching way too many YouTube videos on how to knit. And that’s one of the things I’m currently doing. I joined a knitting and fellowship group at my church and we’ve met three times now. You’d think that I’d get a lot of knitting done and finish the dishcloth I showed you earlier, but I have not. The dishcloth is getting bigger, but it’s not finished. I keep messing up the pattern, and I have about 3 inches to go before it looks like a square. However, it’s just a dishcloth, so I’m not too concerned about how it looks. I did visit a local yarn shop with a member of the group today, and I bought circular needles! And woolen yarn! And I have a pattern for a hat! I’m very excited to start knitting in the round. Please don’t make me finish my dishcloth before I start the hat! I’ve also started a fellowship group at our church. (Our Family Ministry board is working to start a few new groups to bring church members together, doing things that we already enjoy.) I’m organizing a Family Hiking and Biking group. We had our first outing last Sunday, with 4 families joining us! We had unusually warm weather last weekend for February, and it was perfect for a hike up the Des Plaines River Trail. My father-in-law died last fall, and I’ve been trying to organize and purge our things along with his things. It’s a daunting task, but I think we’re almost there. I’ve also been discovering some of my mom’s things in the basement that I really should get rid of. It’s hard to part with things that were part of the lives of people you love. I’ve also been doing a lot of planning; planning our summer vacations (two of them and a weekend of camping!) and planning our garden. More on these things later! And yes, I also had a birthday and still haven’t had my birthday dinner out! Lily had a show choir rehearsal that night and we went down to Danville that weekend for a show choir competition. She is practicing the viola right now and has a mini-concert tonight in preparation for a viola contest on Saturday. I know for a fact, though, that I will get a nice dinner at the end of March when I use my birthday present. Ed bought me tickets to see Carmen at the Lyric Opera! So that is something to look forward to. One of my friends posted these 26 things on Facebook, and I thought it would make a quick and easy blog post! See below for a FREE template! B- Biggest fear: Heights and falling! H- Hometown: All three are in Illinois! Q- Question you’re always asked: What’s for dinner? R- Reason to smile: Fall weather and crunchy leaves! T- Time you woke up: It’s Saturday! I slept in until almost 7:00! Simply open, copy and paste wherever you’d like to use this meme and fill in your own answers! It seems like every weekend, we have one night that is pizza and movie night. I make my special homemade pizza with two boxes of Jiffy pizza crust mix spread into my large jelly roll pan. I use Pastorelli pizza sauce from Chicago, Illinois. The Lemon Drop Pie family pizza features pepperoni and onions, with no onions on Emmy’s corner. When there are five minutes left to bake, I top it with fresh mozzarella bought in bulk from Costco and then frozen, because we’re frugal like that. 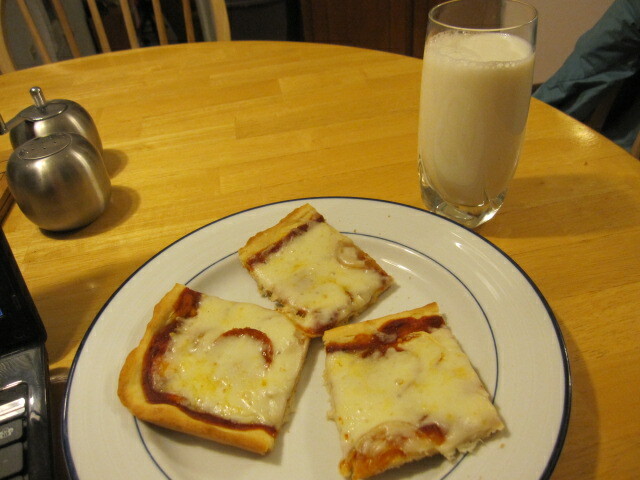 I prefer to eat my pizza with a big glass of milk. I’ve heard that’s weird. Do you think it’s weird? Tonight’s movie pick from the library archives is Chicken Little, a movie I don’t think I’ve ever seen before. It’s surprisingly more about a relationship between a father and a son than the sky falling. Do you have pizza and movie night at your house? What’s the last movie you watched together? Oh, my, I have been up since 6:00 not by my choice. The girls are watching cartoons, and I’m sipping a cup of coffee while fighting off a “didn’t get enough sleep headache”. 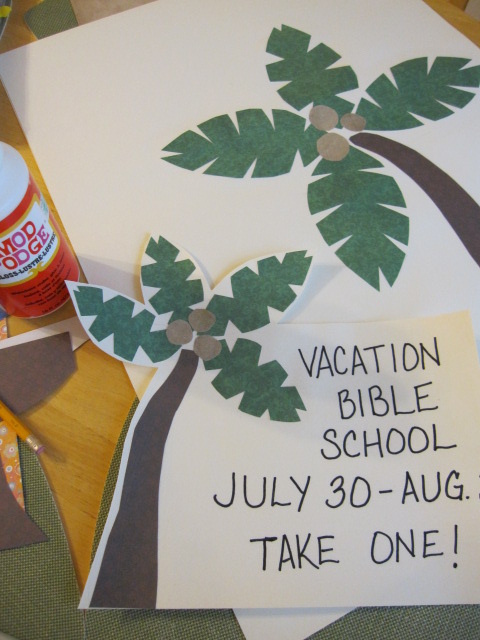 I stayed up way to late last night making palm trees for my VBS displays. 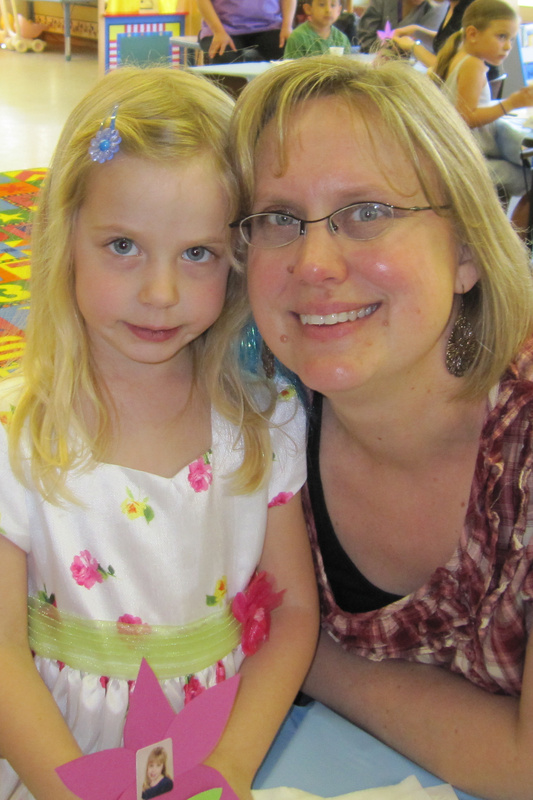 Yesterday I went to Emmy’s preschool for a Mother’s Day Tea, complete with Oreos and doughnut holes. Does anyone else use Bloglovin? It’s an “in between” sort of time for me. There’s a Halloween black cat still hanging from the front door, and yet there’s a wooden turkey in between our bushes out front. Lily’s scary Halloween pumpkin is still sitting on the porch (I can’t bear to throw it in back yet), but there is my Christmas sled decorating my little wooden bench next to the scary pumpkin. The last piece of pumpkin pie that I am now eating was too big for one person, yet too small to divide into two pieces. It’s that in between time of not wanting to give up my daily writing, and yet being unable to find the energy to write a post. That time of wanted to persevere until I write something palatable, or the time to click “publish”, brush my teeth, and crawl between the covers. I’ll have something more for you tomorrow. For now, I’m clicking….